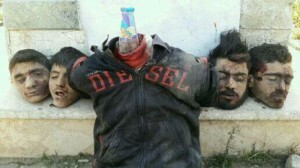 This is what happens to people who will not convert to Islam when the radicals come calling. ISIS (IS) is an example of what can happen when Islam is unfettered. I’ve heard it said, “The only good Muslim is a bad Muslim” meaning one who does not really follow the Koran completely. The display is to intimidate conversion to radical Islam?? STEVE RAY: Or to punish refusal to convert and to scare others. May God have mercy on these poor Christians. May God have mercy on the Archbishop of Mosul, and of course, he is right-except for one thing-they have already begun to come after us. Their jihad began on 09/11/01. Pray for our brothers and sisters in Christ throughout the world. 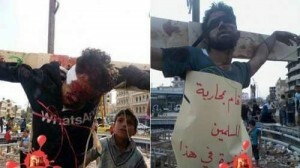 Evidently Mohammedans/Moslems are obviously not of God and appear to be the anti-christ? Anyone who says otherwise is a liar or has not truly read the quran or must not watch the nightly world news. How much longer will it take the blind, politically correct Catholic Church to figure this one out? All of this ridiculous so called ‘inter-faith’ rubbish is making things even worse and is further confusing young Catholics, some now lost to dreadful islam and now seeing dodgy islam as being credible and an option. God gave us eyes to see and ears to hear. HE wants us to say what we mean and mean what we say and our yes to be a yes and our no to be a no…not to be politically correct in the face of evil, which then becomes evil too! Furthermore, look at ‘peaceful’ civilised, terribly bullied Israel surrounded by millions of barbaric moslems who are hellbent on destroying jews and themselves too. Even if Israel gave them the land where Jesus walked, it would make no difference, these hateful muslims will still murder the jews and are sworn to do it, apparently killing is like sport to them. What a wonderful world it would be without islam. Sorry to say but the ‘luke warm’ politically correct Catholic Church needs to have a huge reality check? The protestants are way ahead of us and are rightly standing up and supporting Israel. Over to you Holy Father Pope Francis…we need all Catholics to be singing from the same hymn sheet in order to save souls. I was in correspondence with a fellow Youtube use who said he knows a lot of ‘good’ muslims. Maybe they don’t follow the Koran completely.